As we prepare for the Summer Swim Season, we are pleased to announce that the Special Spring Beak Discount is being offered again this year. In addition to a Family Membership Discount worth $50.00 for joining early, we are throwing in 2 FREE Guest Passes a $22.00 value, $25.00 in Concession Stand Credits, and an Aqua City T-shirt valued at $11.00!! 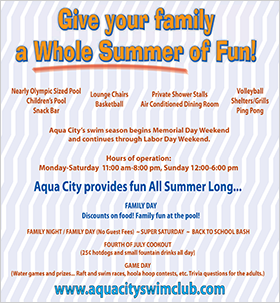 It will allow an individual or family to have fun all summer long at Aqua City! 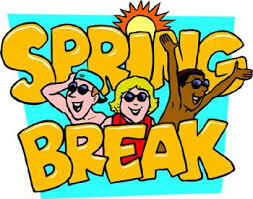 You can save $111.00 by purchasing the Aqua City Spring Break Special Package. This offer is good through April 15, 2019. Just stop by the office to purchase one. Some of the events we have planned for this summer are Super Saturday, Family Night, Independence Day, and GAME DAY. So, get the trivia knowledge and energy together and bring the family on out for some fun in the sun. Tell your friends and neighbors about this Special so they can take advantage of the discount and you can earn a $25.00 referral fee for recruiting a family that has not been a member the previous two years.